For the past thirty years, inspirational speaker James Lloyd has captivated and motivated audiences on five different continents. He magically engages listeners with his genuine down-home approach – a unique blend of timely humor, insightful knowledge, contagious enthusiasm, and personal sharing. James plucks his poignant stories from a background rich in training, leadership development, sales and customer service. While memorably weaving this all together, James displays a remarkable gift to touch people’s hearts. 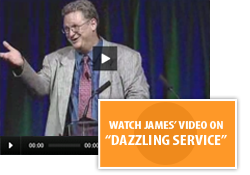 James imparts vision and encourages audiences to visualize new horizons and develop to their fullest potential. James ignites a spark, and people "catch" his passion to awaken that fire within and burn brightly – keeping positive and striving for excellence.